If you want to automate this process, there are a few steps involved… I used curl, which is easy, but other tools can also work. Substitute your own Google username for [USERNAME]. Substitute your own Google password[PASSWORD]. Note: I’ve shortened these (and made them up) but it’s but it’s basically 3 keys SID, LSID, and Auth and their associated values. You’ll need the value for the one labeled Auth. OK, if it all worked, curl returned your subscription list as OPML. Hooray! Also, you just used OAuth, so Double Hooray! I know that most people believe that Google will not lose their data, or if the day comes they want to export this data, they’ll just go to the site and export it, but this lets you prepare for the day you can’t get to the site and export your data… or the day Google loses it, or deletes it, or whatever. 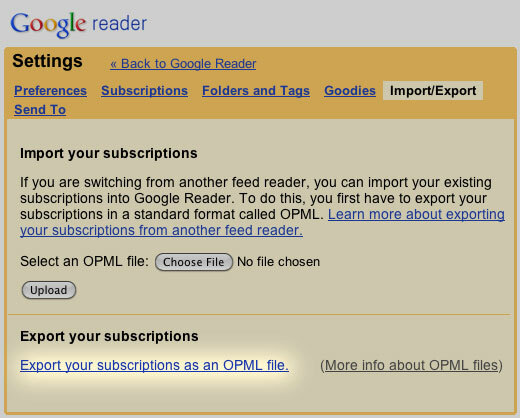 By the way… I found most of this information in the Google Reader API wiki. It’s nice that Google is providing an API for things, I just wish some of the info was easier to find… as of this post, that’s the only damn page in that entire wiki! And just for fun: This gem from 2007: Data Loss At Google Reader. Posted on Monday, August 16th, 2010 at 5:00 pm. Subscribe to the comments feed. Both comments and pings are currently closed. Post on your own blog. The described way is not OAuth. AuthSub and ClientLogin are Google’s proprietary authorization APIs, available as an alternative to OAuth for most Google APIs. If possible, you should migrate applications using these auth mechanisms to one of the recommended options above. Hmmm, so this is Google’s proprietary authorization scheme and not actually OAuth? Why would they do that?